Gotta Be Nuts is a series of interviews with people who inspire us. Where were you when Cyclone Nargis battered Burma? We were in Singapore. Like many of our friends, we watched the news on TV and got progressively angrier when images of the disaster trickled out. We wrung our hands in despair when we heard that the military government had refused to allow international aid workers into the country. And we cursed loudly when we found out that the generals were using the aid that did get in for their own purposes. But after that , we flicked the channel and well, got on with life. What could we do if even the UN couldn’t do anything? And then our friends at Project Enlighten wrote to us about Lisa McCoy. The former librarian had been a volunteer on the Thai-Burma border, and was now planning to get on the next available flight to help with the relief operation there. Her contacts inside Burma had worked out ways of delivering supplies directly to cyclone victims – now all they needed was money to buy food, medicine and other necessities. Would we be willing to contribute? Project Enlighten promised that every cent donated would go towards the aid effort. Lisa, they said, would make sure that our money was well spent. She kept her word. In the weeks that followed, we received regular updates, along with photographs and Excel spreadsheets detailing where our donations went. Everyone who gave realized that no contribution was too small. Thanks to Lisa, we no longer had an excuse to say we couldn’t do anything. Q: Can you give us an update of your relief efforts? L: So far, Project Enlighten has raised over US$12,000 towards their ‘Burma Cyclone Emergency Relief Immediate Action Plan’. The money was given to ABITSU (All Burma IT Students’ Union) , who had a ‘Cyclone Emergency Relief Response Plan’ in place whereby registered Burmese citizen volunteers drove shipments of aid into Burma, and dispersed this aid into the devastated delta areas. As of today, foreign aid workers still face many bureaucratic hindrances in gaining access to all districts in the delta region, whereas Burmese citizens face no problems getting into Burma with that aid, and can go through the military roadblocks set up throughout the delta region. Many western organizations are funding Burmese organizations here on the border in this way because it is an effective way to get aid into Burma. Q: What’s the biggest challenge facing the relief team right now? L: That’s easy to answer – the biggest problem right now facing all relief teams in all organizations is funding. We need more financial donations, so we can send emergency aid in to those over 1,000,000 people who have not yet received any help at all. At present, people are very reluctant to donate to any organization because of the lack of cooperation on the part or the military regime to help in relief efforts and to facilitate access to foreign aid workers and relief supplies. There has been a lot of media attention given to the big aid organizations and the problems they are having in gaining entry into Burma with their workers and supplies. There has been no media coverage on the effective way the Burmese organizations outside of the country are effectively helping their own since the very beginning of this disaster. 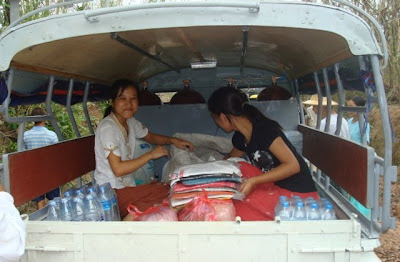 Burmese citizens, inside and outside of Burma, are continuously taking whatever aid they can into the delta region. 150,000 aid workers were needed to cope with this catastrophe. As a Rotarian and team member of Project Enlighten, I would have gladly gone in to ‘lend a hand’, if it weren’t for the fact that I would only have gained access by obtaining a tourist visa which would have kept me confined within the Rangoon city perimeters. All roads outside of Rangoon are blocked by the military who will not allow any foreigners through. L: A lot more needs to be done. It’s been over a month since the cyclone struck. Over the past week the military has forcibly removed people from the cyclone refugee camps and dumped them near their villages with little or no food, shelter, clean water or medicine. The delta region was the main rice-growing area of Burma. One season of rice production has been lost, and the villagers have no food and no means of growing rice since most of the oxen and farming tools have been lost. It is so important that all these victims be reached. 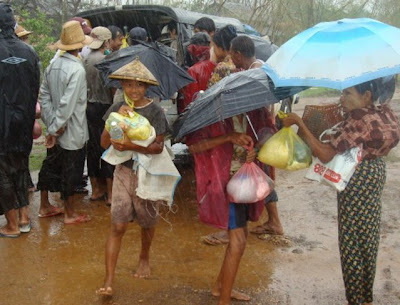 Burma was classified as the poorest country outside of Africa before the cyclone struck. The Burmese people will need help for a long time to recover from this disaster. Project Enlighten will be collecting donations towards emergency cyclone relief efforts through July 2008. Q: I understand you left for Mae Sot almost as soon as you heard about the tragedy, why did you decide to help? L: I spent two months this past winter volunteering as an English teacher to various Burmese organizations here on the Thai-Burma border. As a result, I made many close friends here, who are presently all involved in getting aid into Burma. Many of my students were former political prisoners who were unjustly arrested, tortured and imprisoned for many years as a result of the 1988 student protests in Burma. I also taught refugee students, migrant workers, former MPs from the National League for Democracy and bodyguards to Nobel Peace Prize Laureate Daw Aung San Suu Kyi, leader of the Democratic Party who has been under house arrest for most of the past 19 years. While I was here in February and March, I was in close contact via email with my good friends Asad Rahman and Olivia Lorge, directors of Project Enlighten. My emails were filled with my many concerns surrounding the many injustices, poverty issues and daily dilemmas that the Burmese refugees face. As a former librarian, I was particularly concerned that many of these brilliant young people lacked money to continue their education. Upon my return to Canada, the board of Project Enlighten met and made the decision to start a program, ‘Project Enlighten – Burma’, a scholarship funding program for eligible Burmese students. I most gladly accepted the position as education coordinator for this program. This new program is now accepting donations towards this end. Many of my students in Mae Sot continued their English lessons with me via email upon my return to Canada. I heard about the cyclone from my students. Their emails of concern for their loved ones back in Burma broke my heart. These students were frightened and unable to contact loved ones inside Burma. As the death toll numbers rose throughout that first week after the cyclone, all of us at Project Enlighten became deeply concerned and put into place a fundraising campaign for cyclone victims. I knew that many of the Burmese organizations here on the border had networks in place whereby aid was being constantly taken into Burma from Mae Sot. 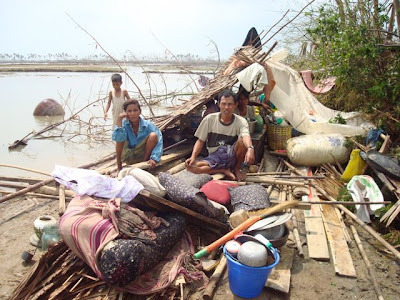 I contacted my Burmese friends and was informed that they all were taking emergency cyclone aid into Burma, and they were all accepting donations towards the purchase of aid. I came to Mae Sot to act as a liaison between ABITSU and Project Enlighten. Words can’t express how wonderful it is to see the Burmese organizations here on the border working hard together to get this aid into Burma. They all do it on a volunteer basis, with no money kept for themselves. Read more about Lisa’s volunteer work here. Make a donation to Project Enlighten here. Support our friend, Annie’s, fundraising effort here.